I’ve been listening to Midnight Oil nonstop for the past week. This wasn’t the case for chunks of time in the past decade. New music tastes, life occurrences, the band’s parting of ways on the stage and in the studio led my ears away from my FAVORITE BAND OF ALL TIME. But they were never gone from my heart. Ever since those warm Tennessee days in 1987 when I awoke to this new sound from a country so far away, they have stayed in my auditory cortex, in my blood. Music lovers all over the world recognize this. If given the means and time I would have seen every show they ever did. But I’ve danced to them three times live, once just a week ago. I traveled from Florida to Toronto to see them. It had been fifteen years. They are currently on a reunion tour. Fans all over the globe coming out in droves. Waiting in line for hours. Donning their old concert tees. Swapping stories. A quirky, nerdy, socially and environmentally conscious group of people sharing a diehard love for this Aussie band we only dreamed would reunite. This rekindling of my love for the band has me sifting through all their albums and compilations and remembering why I started listening to them in the first place. They were different from any of the alternative bands I was listening to at the time and definitely different from the bubblegum pop dominating the radio. They brought global awareness even though many of the issues I did not quite understand, me living in Antioch. Who is Jimmy Sharman, where is Alice Springs, and what is a bullroarer? Midnight Oil inspired me to be more environmentally conscious, to research, to write, explore, travel, dance wildly. I listened to them in my teens when I needed to be understood. I listened to them while waiting for my dad to have brain surgery. I listened to them while pushing my son in the stroller. I’m listening to them now as I write this, those teen years long gone, wrinkles on my face, my father alive and well, my son now a teenager. 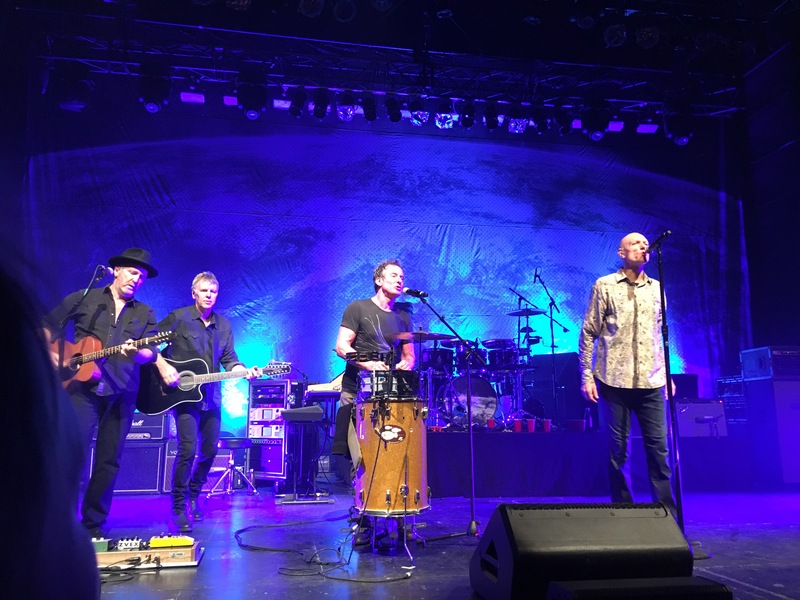 Thank you Midnight Oil for sharing your gifts of music and awareness with the universe. Thank you for coming together, perhaps one last time, to re-instill all that we love about you and continue to. A special place in our hearts, always. And damn did you rock the stage. I too didnt play them much over the last, well, 20 years or so. The odd blast but they were often a year or more apart. The tour was announced and tix were purchased for two shows here in Australia and they were on high rotation again. Then my brother lucked into 2 tickets for the opening show at Selinas in Sydney. It was just immense, a whole body-mind experience, reminding me of the urgent, breathless shows of the early 80s which put them at the top of my list of live acts, with only Bowie in 78 to match them. This one was possibly even better because while they played lots of that pulsating early stuff, the almost brutal power was leavened by the melodies, harmonies and stripped back acoustic beauty of the later material. My brother turned to me at one point to say ‘it is a privilege to be here’ And so it was. That show was six weeks ago and I am still buzzing, watching clips from the tour and scanning Powderworkers and media reports, with an Oils soundtrack as accompaniment. Hope you can get to see them again on the second North American leg later in the year. Great memories, Jen. They were and still are one of my daughter’s favorites, so I’m familiar with the group. Your post describes how I felt about the Beatles, two decades earlier. One of the high points of my life was seeing them live in the 60’s! Thank you Carol! Glad to hear your daughter is a fellow Oils fan. And my parents were big Beatles fans too and introduced me at a young age. I’m glad this reminded you of your love for them!